When I am running out the door, this is how I will look. Nothing like throwing on a blazer to make ripped jeans acceptable for an afternoon meeting. The cute booties don’t hurt either. Literally been wearing them everyday. Natali - Beautiful!! Everything’s perfect about this outfit! Code Overdressed - Nothing is more sophisticated than a crisp white blazer, love how impeccable it looks on top, and how the jeans add an edge to the look, perfect! 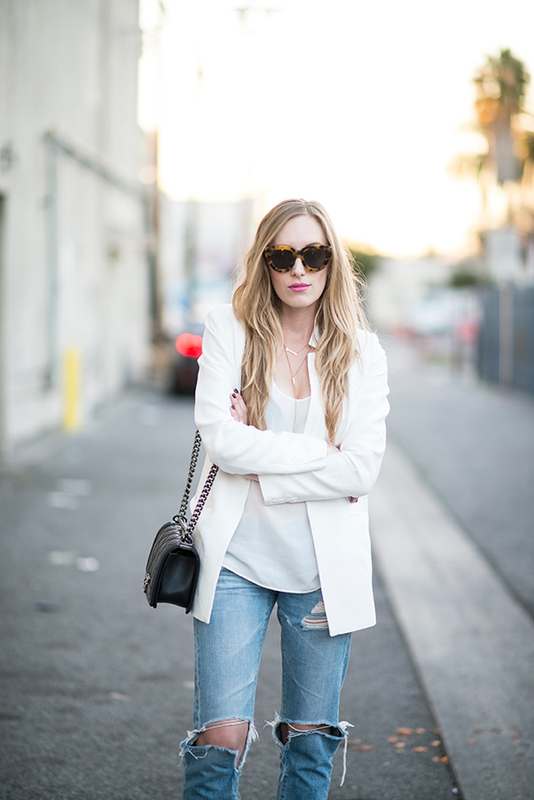 yarden - AMAZING outfit- so clean and beautiful- love the boyfriend jeans with your shoes and this white beautiful blazer. Leslie - Love those jeans and the white blazer! SO cute! The Cassie Paige - I love this outfit! Great bag and shoes! You look amazing! riris - You looks awesome with this outfits. I’m obssesed with boots, lately and your boots looks lovely. Sofia - Loving this look on you. Beautiful and chic. Angie Wilson - love your boy bag! I just got one in red. And those sunglasses, are gorgeous. Great look! Jennifer - You are always so lovely hun!